Black beans and quinoa go together like Laverne & Shirley. But, unlike Laverne & Shirley, sometimes even perfect food combinations can get boring. As a general rule of thumb, if I start to get bored I think “fruit.” And if it’s winter, well, I think frozen fruit! I love berries in savory applications. They add lots of body to sauces without adding any fat, they add depth of flavor and they provide just a hint of sweetness. The sauce has smoky spiciness from chipotles and a toasty, nutty flavor – as well as creaminess – from toasted almonds. I threw some sauteed broccoli in for green. I gladly ate this as dinner, but you can also serve it as a side dish with any Latin inspired meal. But no matter what, definitely hum the Laverne & Shirley theme while you cook. It’s kind of empowering. Notes: Chipotles vary in size, but generally even if you are a spice wimp, you should be able to handle 2 chipotles that have their seeds removed. If you are a lover of spice, then start with 3 and add more if you like. In a small saucepan, combine the quinoa and water with a pinch of salt. Cover and bring to a boil. Once boiling, lower heat to simmer and cook until quinoa is tender, about 20 minutes. Stir occasionally. In the meantime, preheat a large pan over medium heat. Toast the almonds, tossing them frequently, until they’re honey brown in spots. Remove from pan. Reserve about 2 tablespoons of the almonds for garnish, the rest will go into the dressing. Now, in the same large pan, saute the broccoli in oil and a pinch of salt. Cover and cook for about 5 minutes, tossing frequently, until tender. When it’s done, just let it sit in the pan uncovered. Now prepare the sauce. Place the garlic clove in a small food processor (I use the Magic Bullet) and pulse to chop. Add the almonds (except for the reserved 2 tablespoons) and grind to a coarse powder. Add remaining ingredients and blend until smooth. If it’s too thick, thin out with a little water. 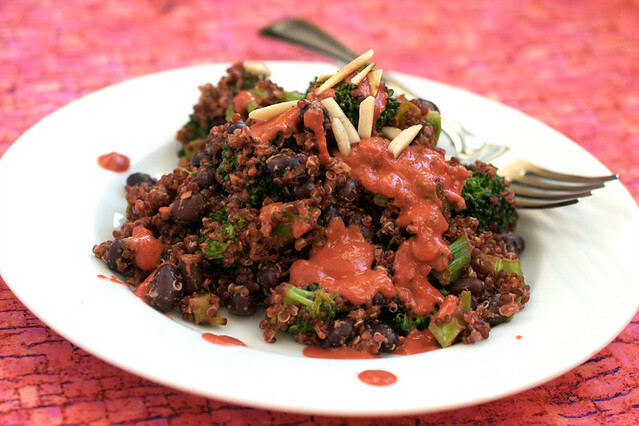 To assemble, toss the quinoa, black beans and broccoli together in a mixing bowl. Reserve about 1/3 of the dressing. Pour the rest of the dressing into the mixing bowl and toss everything to coat. Transfer to plates, drizzle with the extra sauce and garnish with almonds. The Magic Bullet? I have been thinking about buying one of those forever, but I just assumed it was an infomercial product meaning it’s never as good as the TV says. BTW, that sounds crazy delicious. Yeah, I know, the Magic Bullet. But it really works! If I start talking about it I will sound like an infomercial. But I love that you don’t have to dirty up a food processor and you can store leftover dressing/sauces so easily. I swear they didn’t pay me to say that! Maybe they should pay you to say it! You have sold more than you know, I bet. Recipe looks awesome btw. And have you been raiding my fridge/pantry because every recipe you make is one I could whip up without a trip to the store! How I miss Laverne and Shirley – they don’t make shows like that anymore. I often mix pomegranate syrup with vinegar for a “raspberry” vinegar substitute. I’m wondering if using some pomegranate syrup and/or seeds might work in this. I’m pretty much a spice wimp, but I think I’ll give this a try. I also have a magic bullet. It is kind of cheaply made so you have to be careful with it, but I use it so much and it’s so useful and convenient, that even after my first one broke, I bought another one. I often mix pomegranate syrup with vinegar for a raspberry vinegar substitute. I’m wondering if using some pomegranate syrup and/or seeds might work in this. I’m pretty much a spice wimp, but I think I’ll give this a try. I just took the Magic Bullet back to Costco for a refund…EVERYTHING stayed stuck at the bottom. Didn’t like it ONE BIT, but a friend has one and loves it. I may have gotten a lemon, but it was horrible and wasn’t up to just exchanging it for another. Upside of the trip to Costco to return the Magic Bullet was that I bought a bottle of Raspberry Chipotle sauce…talk about perfect timing for your recipe! 😉 Yes, it’s cheating, but I’m lazy tonight and this sounds fabulous. Off to create something yummy…thanks! I have frozen strawberries—how do you think that would work? I think it would be good, too! Raspberries are a bit tangier so you might want to add a few drops of a mild vinegar. Just got a Cuisinart Mini Prep 3.5 cup last week – love it!!! Perfect for applications where the larger food processors are overkill. Can’t wait to try this recipe – probably Saturday. made this tonight and cheated with some pre-made pomegranate chipotle sauce… but it was delish with some valentina hot sauce on top! Only wish I had all the ingredients to make this…have saved the recipe for when that opportunity presents itself. Thanks. This looks fantastic though! I love the idea of sweet fruit with black beans… a nice substitute for plantains. It would but the peppers add a savoriness. I wonder if you could add some sauteed onions and (like 1/4 cup) and smoked paprika to compensate. It will still be good if not. I like it! I’ll give it a whirl! What a fun combination of flavors..
so true; i think most intro’s to quinoa start with black beans (here was mine: http://cookmarked.com/recipe.aspx?eID=hlKUQoIKj). i love this chipotle raspberry sauce though! sounds like a great accompaniment to grilled tempeh. Recipe came out to perfection! Didn’t have chipotles in adobo, so used smokey chipotle chili powder. The raspberry sauce was wonderful! I forgot to purchase almonds while at the grocery store and instead substituted Cashews ( NEVER again), if I made the recipe over I would not use the Chiles in Adobe, it could have been because of the cashews as well but I felt it had too much going on when I made it, a very nutty cashew taste and smokey flavor. I like the time factor of it though, it was pretty quick to throw together. I liked this! I think when I make it again, I’ll play a little bit with the quinoa/bean half of the recipe – I was thinking maybe spinach and/or raisins could be good additions. The chipotle raspberry sauce was absolutely perfect. I just made this and it was wonderful! I will probably just use two chipotles next time instead of three. I like spicy, but three seemed to be a lot. I really liked how fast this was to throw together. It’s definitely one I’ll make again. De-li-cious. The raspberries give a little tang to the sauce, and goes wonderfully with the smokiness of the chipotle. I made some changes: cooked the quinoa in rooibos tea (I always cook my grains in tea, or sometimes stock) which has a sweer flavor that I thought would go well with raspberries; didn’t have broccoli so I used red peppers, celery and onion; used lapsang souchong tea in lieu of water in the sauce (this tea has a very strong smokey flavor that goes perfectly with chipotle); used other beans than black (don’t know which, though). Only problem, there wasn’t even close to enough sauce! So next day, I made an entire new batch of sauce to mix with the leftovers, and now it’s perfect. Thanks for the recipe! It made a delicious and different meal. I’m definitely doing it again, and doubling the amount of sauce. Thanks for dinner tonight! Got everything except the broccoli. Guess bok choy will have to do. How did the bok choy work? I was thinking the same thing as I have a bunch in my fridge at the moment and I REALLY want to make this for dinner tonight! This is delicious! I added a tsp of cocoa powder and a tsp of sugar to the sauce and it added something. I don’t know what. It was something. LOVED IT! And so did my husband, who is sometimes a little skeptical of my vegan cooking adventures. Tasted amazing, and was so easy to prepare. I doubled the sauce (as per a suggestion up above) and I’m glad I did! It was so good! Will definitely make this again! So I really wanted to make this and I just so happened to have chipotles and cooked quinoa to use. I subed frozen pineapple for the frozen raspberries and corn for broccoli and it is completely delicious. This sauce would make a great marinade for summer BBQ’s! Do you think this would keep well as leftovers? 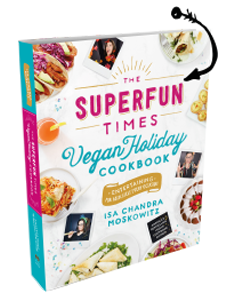 Thank you for another gluten free vegan recipe, I need all the help I can get! I was just finishing up a completely different dinner when I found your blog. I just put all of it in the fridge and made this instead! I am currently trying to not nibble on it while I wait for my partner to come eat with me. The sauce is exactly everything I’ve ever wanted from a sauce! And I happen to have a huge amount of quinoa that I’ve been trying to find uses for. I am almost trembling I am so excited about your blog! Ooh…I have a nut allergy. And a soy and various seeds so it makes being vegan hard, but I so want to. I am allergic to sunflower seeds but can do sesame seeds. Can you think of any substitute for the almonds that would work or this recipe a “skip”? I bet tahini would be excellent in the sauce! I just made this recipe and loved it. I used fresh blackberries instead of frozen raspberries and the sauce still came out amazing. To the person who was wondering how this would fare as leftovers, I think it’ll make excellent leftovers and be very versatile. I’m planning to incorporate my leftovers into salads and maybe a wrap. is this served hot or cold? has anyone tried it with strawberries? Sadly, I didn’t like this. The sauce wasn’t very flavorful, I could really only taste the chipotle, I wouldn’t even know raspberries were in there. Maybe it would be better on something milder like baked tofu where you could actually taste the sauce. I made this last night, and it was my first success with quinoa! I did change the recipe a little- I dry-toasted the quinoa in the pan before adding the water to cook it, and I think that gave it an extra nutty-licious taste. The sauce is good on it, and would also be good on other dishes where it could shine even more (the quinoa absorbs it a little). But yes, I will definitely be making this again! Great on a warm summer night, with a green salad on the side. I also really did not like this. I did not find the sauce that flavourful but thought I had remedied it with more agave. It was also my first time using chipotles in adobo and I think I had an adverse reaction since my stomach was feeling quite queasy afterwards. However, even my bf, who loves all things spicy, did not care for this either. I felt like it was a waste of great ingredients (I used fresh raspberries). I just made this and it is amazing! I have never cooked quinoa, so it was exciting to see it grow from tiny little pellets into the soft quinoa. The flavor is wonderful. I used 3 chiles, and it’s a little spicy, but not bad. (I like things really spicy). I don’t understand how every single thing I have made from this website has been absolutely delicious! I am usually an incredibly bad cook, and end up with food that is barely-edible. Not so for Isa’s recipes! They are somehow foolproof, yet complex enough to taste wonderful. Yum! Just made this and used dried chipotles (2) instead of in adobo and just added a splash of apple cider vinegar and ketchup (the basics of adobo sauce, if I recall). Mind you, the peppers weren’t seeded, so HOLY HECK it was spicy, but SO GOOD. Thanks for a new twist on the legumes+grain+greens idea! I was aware of this previously, but still there were some beneficial pieces which concluded the image to me, appreciate it! Mango, Black Bean and Quinoa Salad « the taste space – steam, bake, boil, shake! Delicious! My partner is pre diabetic & on a low sodium diet (even though an athletic slim vegan) so I eliminated the sweetener and salt, and used a quarter teaspoon of chile chipotle powder. A great success! When cooking the black beans, dried , in a pressure cooker, I added cumin, turmeric and chopped fresh cilantro since I was going to make a very tame raspberry sauce. Definitely a keeper! there. All parts blades cups – $5.00. Such a deal & I love it. Use it almost every day. Thanks for sharing your talent with food. You are so much fun! Made this last night. Absolutely delish. Included sauteed spinach instead of broccoli. Blended the sauce in my vitamix, which worked just fine for this purpose. 3 chipotles (didn’t even seed them) and the spice level was perfect for us. This recipe really disappointed me. I have never once found a recipe off of this website that I didn’t like until this one. I’m sorry, Isa, but this recipe does not do you justice. The combination of the raspberry seeds and the quinoa was pretty nauseating. Don’t worry, though. I still think you rule! And I love all of the other stuff you’ve got on here. I’m going to keep using your other awesome recipes. Brilliant. Wowed my vegan friends from out of town, perfect amount of everything, flavor profile spot on…. And I’m not a vegan myself. I will be making this for lunches during the week for me and the husband for as long as broccoli is in season. Thank you, Isa. You sure know how to talk a meat eater out of using animal products. De-lish. Excellent post. Keep writing such kinnd of information on your blog. Im rewlly impressed by your blog. Hi there, You have performed an incxredible job. I will certainly digg it and for my part recommend tto my friends. Unfortunately, I am allergic to almonds. Do you think I could use walnuts or maybe hazelnuts instead?